Almost exactly a year ago, the Acura NSX EV Concept was revealed just prior to competing in the Modified Cars Class at the 2016 Pikes Peak International Hill Climb. Although it looks similar to the NSX GT3 race car, the EV prototype regains the AWD system that was removed in the former. And, not to mention, it’s a pure EV. Is it possible the NSX EV Concept was both an experiment and preview of what the next generation NSX could be? Entirely. Due to be ready to go for 2023, the third generation NSX is currently in the early stages of development, and going by NSX history dating back to 1990, a NSX EV makes sense. The original NSX was powered by a then-revolutionary transversely-mounted mid-engine gasoline V6. Today’s NSX has a longitudinally mounted twin-turbo V6 paired to three electric motors. The NSX EV Concept has four electric motors only. See the progression? Need further proof for an all-electric third gen NSX? Autocar recently spoke with Sekino Yosuke, Honda’s head of research and development during a demonstration of the NSX EV Concept going up Pike’s Peak, who stated that the concept is "not just a competitor car. I would like to make such a car in production, and there are some studies around that. We want our electric cars to be joyful to drive, and it is clear that this proposal, with around 1,000 hp, is both joyful and uses technology that could one day reach production. We are evaluating what is possible now." And, by the way, the NSX EV Concept delivered results. It came in third overall in its class at Pike’s Peak last year. With one electric motor stationed at each wheel, the proven and SH-AWD system makes for an ideal partner to deliver both performance and a thrilling driving experience. We also hear that the concept’s batteries are capable of taking the car up to 200 miles on a single charge. With battery technology rapidly improving, imagine what that range will be in five years’ time. 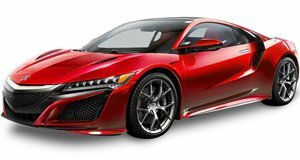 The Acura NSX has always been about progressions and pushing the technological limits. Heck, the name NSX stands for "New Sportscar eXperimental." All-electric supercars are already proving themselves (see: Rimac Concept One), and we’re bound to see more arrive in just the next few years from brands both large and small. Will Acura be one of them? We certainly think so.